I was visiting my local Goodwill store last week on the hunt for some $5 chairs to paint when I found this instead. I wish I remembered to take pictures of it in it's original condition but the thought hit me after I had already cleaned it up and taped it off. This is it looking really good. When I got it it was covered in half torn off stickers with that sticky paper stuff all over the mirror and the frame portion was more grey than black. It was filthy with dust and dirt with cobwebs in the corners. For a moment I considered fishing back through my trash and trying to stick the stickers and paper back on and going outside to grab a handful of dirt so that I could smear it all over the frame. I wanted you guys to get the full effect of what this thing actually looked like. But then I thought of how much work that would actually involve and I decided against it. You'll just have to take my word for it. It was gross. After a little soap, water, rubbing alcohol (to remove the sticky mess), and Windex it looked like what you see now. I painted the frame the same blue color that I used on my shutter project. This is where the fun comes in! 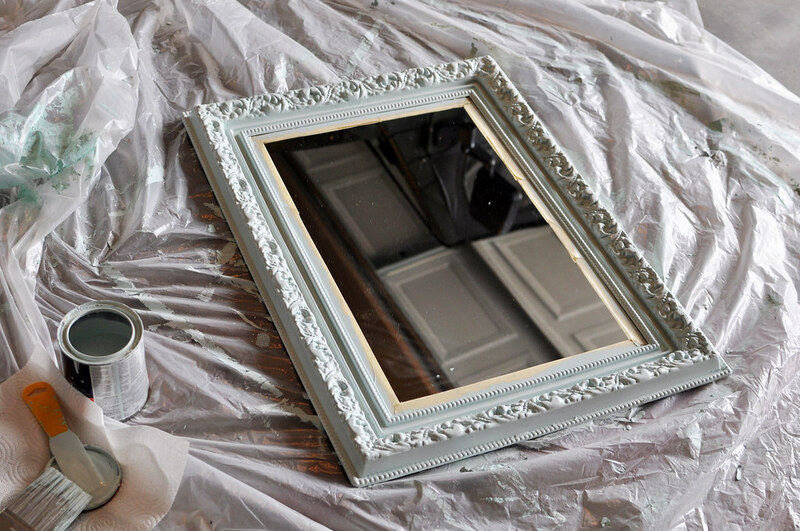 I've always wanted to try this stuff out and when I saw this mirror I knew it would be the perfect project for it....Chalkboard Paint!! Valspar makes it (there may be others too) and I picked my can up at my local Lowes Hardware. I bought black but I believe it can be found in green as well (but I wouldn't go that route, JMO). After a few coats of paint it was ready to hang. I placed it on a wall in my kitchen/breakfast nook area. I plan to use it to jot down grocery items or appointment reminders...or maybe even a few love notes to the hubby...my 1st grader can read so they will have to be G-rated, he he! For this week though I thought I birthday greeting was appropriate! Whenever I decide to change it up I can just wipe it clean with a damp cloth...of course you can use a chalkboard eraser if you prefer but I like things clean. Maybe I'm a bit OCD. And while I was painting I got out these two wall plaques that no longer fit my decor. I was getting ready to give em' over to Goodwill when I decided that they could be repurposed into something more useful. So, after a little paint...Ta Da!! Isn't it cute?! I put it in a black stand I picked up at WalMart a while back but they already have hanging hardware on the back so they can just as easily be hung on a wall. I think they would look great on a child's bathroom counter with the words "Brush your teeth" written on them. In fact, I think I might do that with mine. Would you like to have one of these cuties in your home? I don't really need 2 of them. You would?! Great! GIVEAWAY!!! Mandatory 1st entry: Follow my blog and leave me a comment so I know. 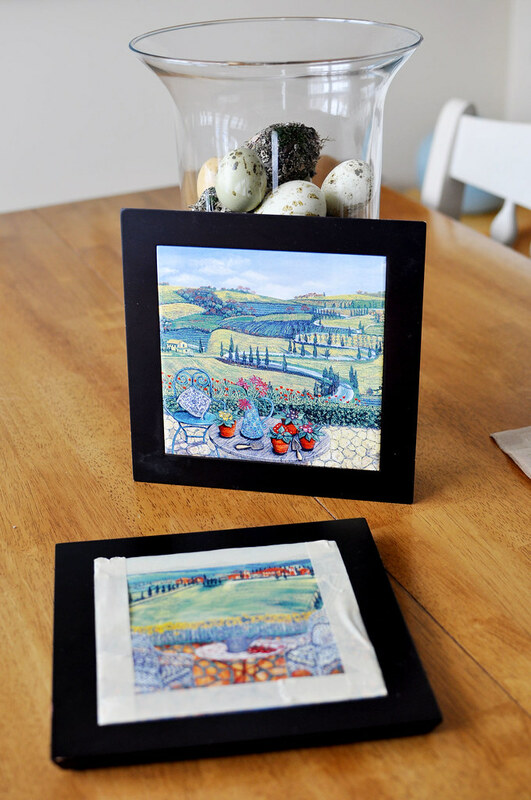 ~Make a quick entry on your blog linking back to this giveaway! 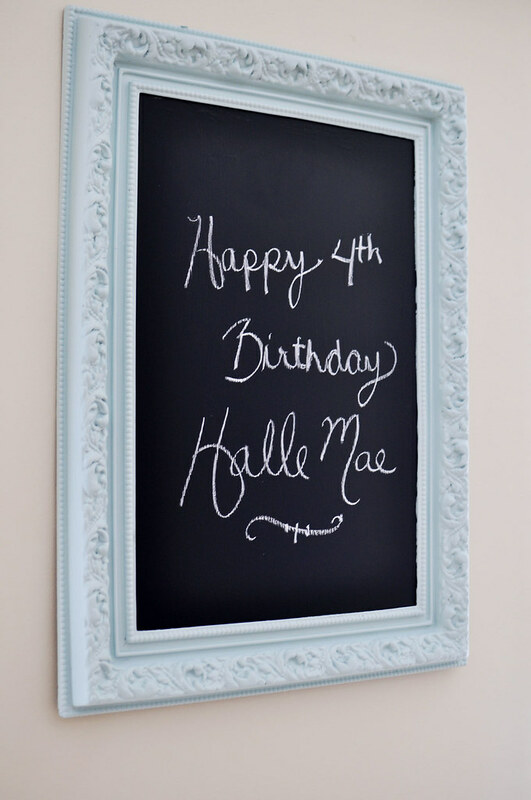 ~Share your chalkboard paint projects. Either give me a link to your blog post showing your project or a link to your project photos at a photo sharing site! That's it! Easy peasy! I'll leave it open thru next Sunday February 14th (VALENTINE'S DAY) at midnight eastern time. Winner will be announced on Monday! Open to US residents only. Good luck! Happy Superbowl Sunday!! How cute are you in the reflection?! I'm a new follower! I've been getting your blog in my google reader for a while. I love all the chalkboard paint projects I've been seeing and think that maybe I should take the plunge. I am a new follower also and have to say I love the reflection ... that is so fun. I have never tried chalkboard paint projects but have her of the. I am a follower. How neat - I didn't even know they had chalkboard paint! I'd love to have the probject - thanks for the chance! 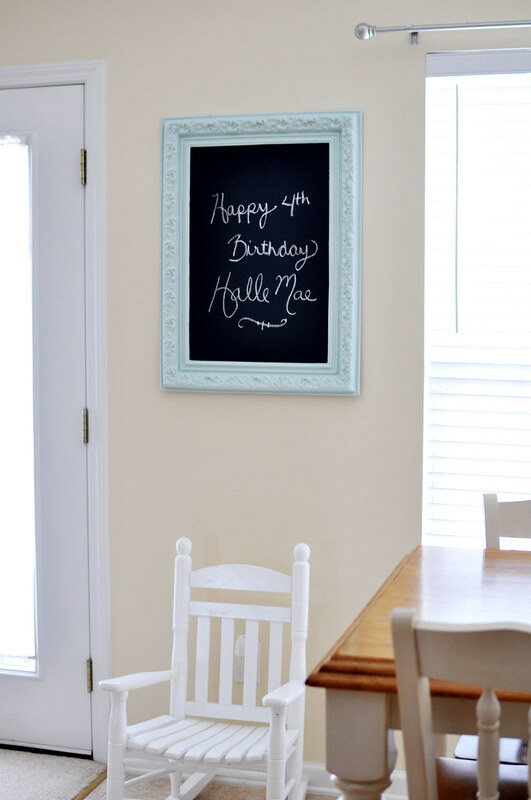 I love the idea of chalkboard paint, but have never actually used it for anything yet! I love your mirror-chalkboard project, though. Gives me some ideas! I follow your blog and I would totally love to win! What a great idea. Maybe I will try it. I follow your blog! love the big chalk board - did you paint that right on the mirror? That's an easy idea that I wonder why I didn't think of it! 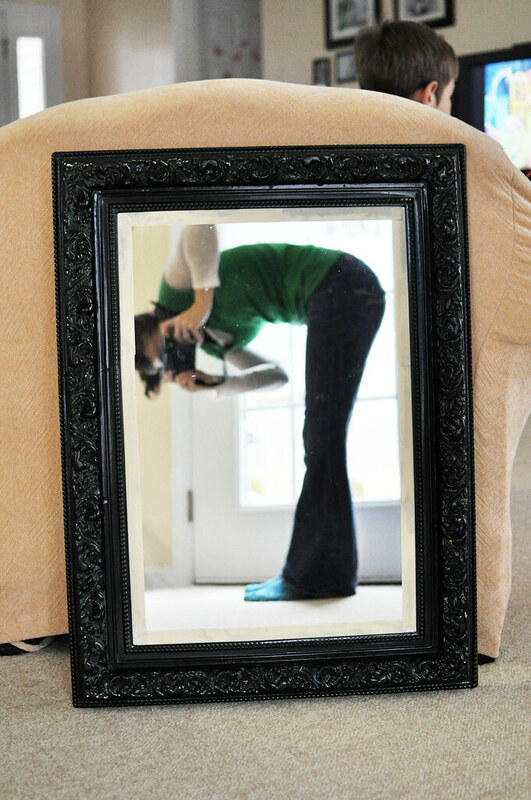 Ok....two questions.....was this a mirror you found for 5 bucks, or a frame? Also, how much was a can of that chalkboard paint? I'm so gonna go thrift store hopping this week! Ali, it's a mirror. The paint wasn't the cheapest but you'll have enough to do a ton of projects with it. I paid $12. You could even paint a large section of a child's wall and frame it out with molding and you'd have an awesome creative space for them!! Courtney, I painted directly on the mirror. Following your blog via Google Friend Connect Name=Alisha L.
I think this is the cutest little re-do project! 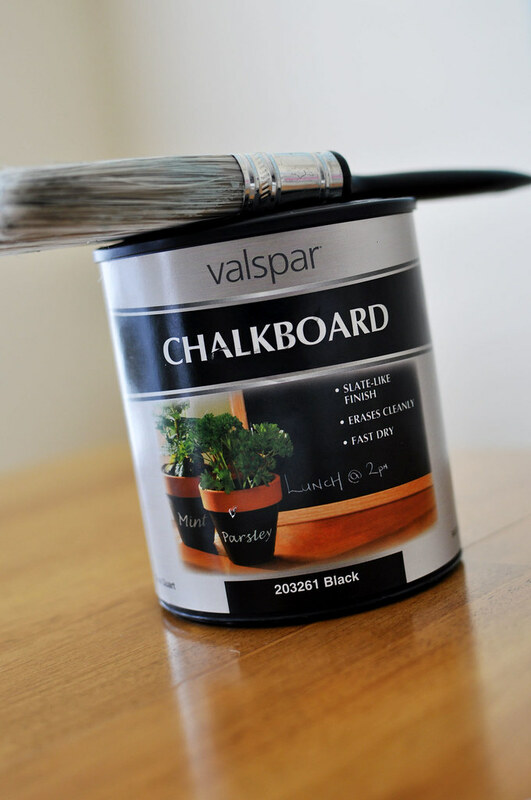 I haven't yet tried the chalkboard paint and now I really want to!! This is a great idea and I can think of so many different ways to use it! Hi, I'm a new follower, just found your blog through TT&J's Weekend Wrap Up Party. Love the little chalkboards. Thanks! You are adorable. I love that shot of you in front of the mirror. And it turned out so cute! Thanks so much for linking it up!!! !